UNITED NATIONS, March 26 -- At the UN, often it is the questions not answered, and the protests not made, that are the real story. On Thursday morning after answering Inner City Press' questions about Myanmar, UN Secretary General Ban Ki-moon was asked to comment, "One of your bodyguards was denied a visa because he is Lebanese. What's your comment?" While Ban answered that "I did enough yesterday. As you know I am leaving for Sirte, Libya," Inner City Press has looked into the issue. The raiser states that in the run up to the League of Arab States Summit in Sirte, Ban's office provide the Libyan mission to the UN with a list of his entourage, and ran into a problem. One of Ban's bodyguard, the raiser says, is Mohammed Abdul-Hussein of Lebanon. Libya and its Leader have problems not only with Switzerland -- for the arrest of Gadafi's son for abusing his employees -- but also with Lebanon, on the matter of the Vanished Imam. The Libyan mission, the raiser says, told Ban's office that Mohammed Abdul-Hussein of Lebanon was "persona non grata." Rather than protest this, Ban or his office accepted, and submitted a list without Mohammed Abdul-Hussein, which was accepted. 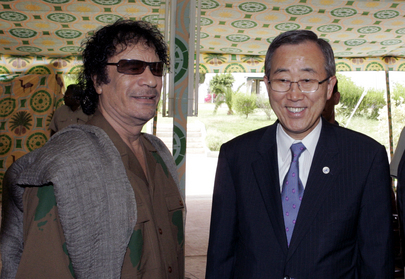 The raiser says a member of the Office of Ban Ki-moon's spokesman told him clearly that Ban knew of the issue, but let it go and decided, if he'd say anything, to say it after the trip to and from Sirte -- this was later denied. But inevitably the failure to protest would be contrasted to Ban's protest of blockage of a journalist from one of his traveling parties. Is the difference class, nationality or religion, the raiser asked Inner City Press? Watch this site.